Halloumi is a white cheese from Cyprus made from a blend of sheep and goat's milk. The flavor is mild but salty and the taste is similar to that of mozzarella cheese. Some types of halloumi have dried herbs such as mint or oregano added as well. When halloumi cheese is being made, the curds are typically cooked at a high heat for at least an hour, but often more. This gives the cheese a rubbery, semi-firm texture that "squeaks" between the teeth and a higher-than-normal melting point which means it softens when heated but doesn't melt entirely. Grilling halloumi is easy. Luckily, these days halloumi can be purchased at most grocery stores. Or look for the cheese at specialty food markets. Halloumi is often sold in pre-packaged 1/2-pound chunks. Slice the halloumi into slabs that are 1/4 to 1/2 inch thick. Place the slices of cheese directly on the grill. 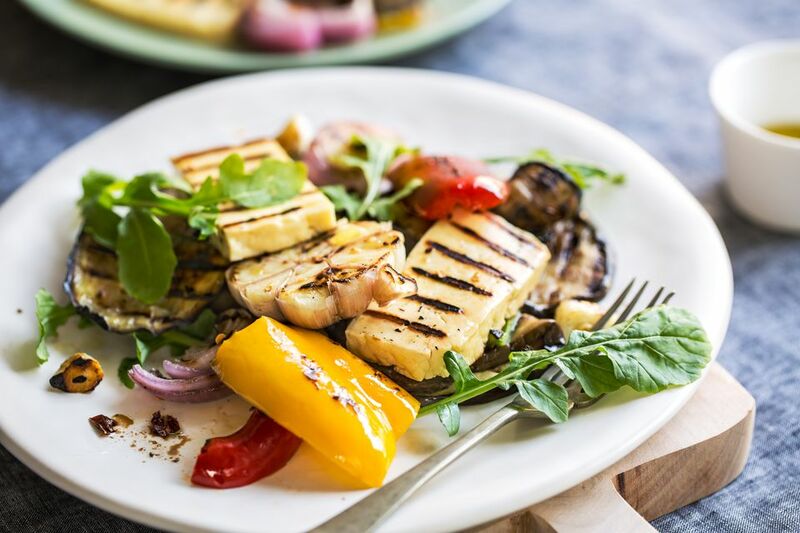 Grill the slices of halloumi cheese for about 3 minutes per side, until the cheese is lightly browned on the outside and warm and soft through the middle. Plate and serve the cheese immediately. Halloumi has the most flavor when it is warm. Garnish the cheese slices with wedges of lemon and/or fresh herbs such as chopped parsley, mint, basil or oregano. If you want to pan-fry slices of halloumi instead of grilling it, cut the cheese into 1/4- to 1/2-inch slabs. Heat a tablespoon of olive oil in a pan over medium-high heat. Add the cheese and fry it for 3 minutes on each side. Often, halloumi is served with nothing more than a squirt of lemon juice on top. Although grilled slices of halloumi is a popular way to cook it, the cheese also can be cut into cubes and heated in a pot of soup. You might want to try it threaded onto skewers and grilled with vegetables or sauté the cubes with oil and garlic or vegetables as well. There are a number of recipes available that can serve as inspiration for even more ways to enjoy halloumi. For instance, you can grill or pan-fry halloumi with sautéed kale or enjoy fried halloumi with tomatoes and balsamic vinegar for an impressive appetizer. Halloumi burgers are a nice vegetarian alternative and delicious with a smokey tomato jam and avocado crema. If that's not cheesy enough, try a sweet and spicy halloumi sandwich with roasted squash, raspberry harissa jam, and a brussel sprout slaw. You can even add warm halloumi to a green bean and potato salad, a recipe that's a British favorite in the summer.